The thin layer of horny keratin that covers the shell of most turtles is very much thickened in the Hawksbill Turtle and shows a beautiful yellow- brown translucence when peeled from the shell. This modification of the relatively small (200-pound) sea turtle is the valuable tortoise shell, once used for luxury combs, boxes, and jewelry. Such objects are now made from plastics, fortunately, as the scales were once peeled off the living animal with boiling water and the turtle released to grow another layer. 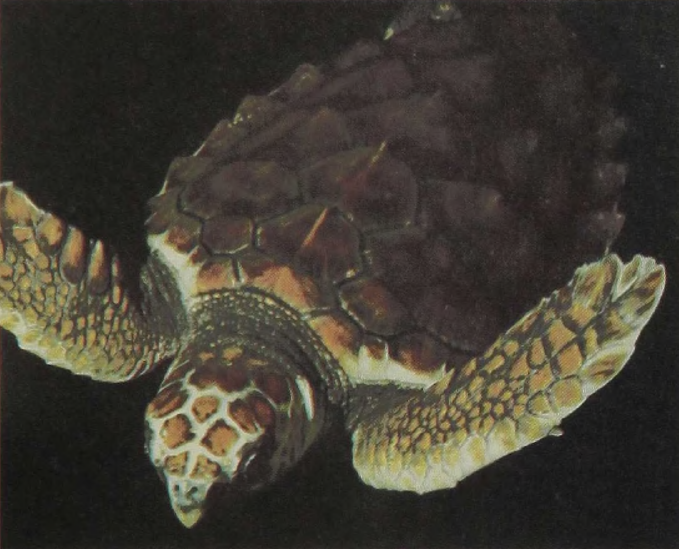 Like all sea turtles the Hawksbill propels itself with its front flippers. These act as a pair of hydrofoils and exert forward forces both during the upstroke and the downstroke, the hind feet being used primarily for steering. Like all other turtles, the Hawksbill uses the hind feet to excavate the nest. This species occurs in several races across much of the Atlantic and Pacific Oceans.